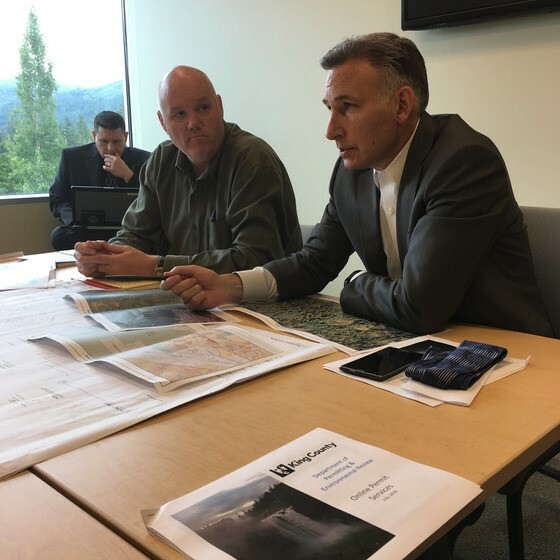 A few months back, I spent some time in Snoqualmie with staff at the King County Department of Permitting and Environmental Review (DPER). DPER ensures that folks are building in ways that are safe for people and for the environment. They are the keepers of a land use code that was developed with input from thousands of stakeholders in our region. With millions calling King County home, and scores more arriving each day, it is important to ensure that we are smart about our growth. So I was excited to visit DPER, put on my urban planning hat, and see how the staff’s work completes the process that begins with policies that I’ve championed as Executive. Doug Dobkins, the lead engineer in the Single-family home product line, invited me to shadow him, meet his co-workers, and see some of the changes they’re making to their work to improve turnaround time and provide a better customer experience. Doug, along with Geologist Greg Wessel and Planner Kim Claussen, help property owners prepare for permits on construction or land projects. 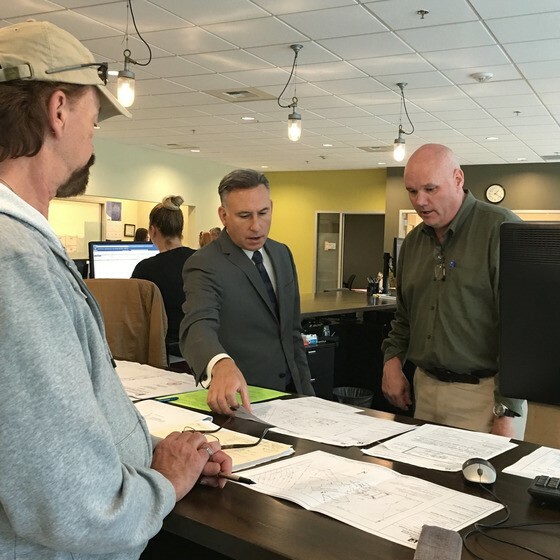 During my visit, the front desk of the permitting center was busy with contractors having their plans reviewed, applicants gathering forms, and real estate agents with questions about properties and the permitting process. I was able to see multiple parts of the residential permitting process in real time. For example, a resident had just requested review for plans to build a large house with a six car garage on a steep site. Doug and the multi-disciplinary review team walked me through the pre-submittal conference, which is an internal review for a proposed project to catch any major issues that might need to be addressed before permits can be approved. We talked about how they have the important – but sometimes unenviable – task of interpreting and enforcing land use and building codes. The county’s Comprehensive plan, and the regulations created consistent with it, are aimed at protecting King County’s natural and built environment in unincorporated areas and promoting responsible and sustainable development to keep residents safe and healthy as the region grows. Over the years they have made numerous customer service improvements, and continue to look for ways to make their customers’ experiences better. The pre-application project review is one example. It was created to make the process smoother, avoiding costly mistakes by the applicant. For some projects, it can take six to eight months to complete, though the bulk of that time is spent on elements that would be required with or without the pre-application, like posting the project for comments, and providing a comment period for the final decision – important tools for giving the public a voice in projects that will impact them for decades. 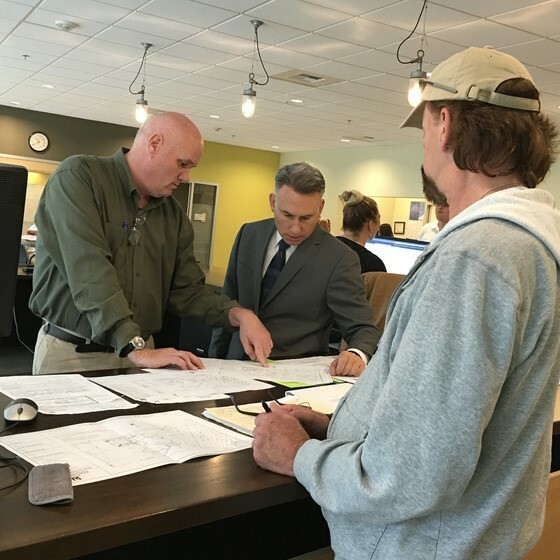 I watched as permits moved through the process, and were examined by Engineers, Ecologists, Planners, Foresters, Plans Examiners, and Building and Fire inspectors, who each reviewed their portion of the submittal package for compliance with the King County Code. I was able to ask these land use experts questions about a project’s site options, and the impacts of each one – interesting topics for someone like me who is fascinated by the real world results of urban planning. It was a complex project, and Doug and the team were very thorough. I was able to see staff use technology to better serve customers, like the iMAP program for accurately locating properties, and the County Assessor’s Office’s online map, which shows easements and aerial photos of properties. I saw that even plans for a large, but simple, detached garage went through several layers of review prior to submittal into the approval process. In 2015, the office processed about 1,700 residential mechanical permits, which includes water heaters, and heating, ventilation and air conditioning (HVAC) systems. Doug explained that those types of permits make up about a third of the department’s annual application totals. Thanks to the booming economy, and the furious pace of new construction and remodels in King County, DPER staff were on track to process about 2,000 of those permits in 2016: an 18% increase from last year. To speed up the process and keep up with the increased workload, staff worked with King County’s Office of Information Technology to update their systems this year and move their process from paper to the internet so that residents can now apply for permits online. Permitting Services Supervisor Kim Simpson and Special Project Manager John Backman demonstrated the new website, which exceeded expectations within a month of going live. An experienced user can apply for and print out an online permit in a few minutes, and about 80 percent of applicants now submit that way, saving time for themselves and DPER staff. In contrast, in-person permitting requests take 15 to 25 minutes of staff time, plus wait time for customers. Besides permitting, DPER staffers provide services ranging from project preparation, to environmental regulation, to staffing the King County Fire Marshal, and issuing business licenses in unincorporated King County. The Executive branch of government that I lead creates and proposes the regulations in the plan with significant input from residents on zoning, density, and how best to manage future growth. All of that feedback shapes the plan that goes to the County Council for review, more public input, and finally a vote on an approved Comprehensive Land Use Plan, which guides DPER staff every day. I was honored to see their work up close. Thank you to Doug for the invitation, and to Permitting Services Supervisor Kim Simpson, and Special Project Manager John Backman for the demo of the online permitting and inspection services. It was a pleasure meeting some of the folks whose work helps to keep our region safe, healthy, and economic vital. I always enjoy meeting staff and seeing the variety of services King County employees provide. Send me an invitation to come see you and your team in action. I look forward to meeting you.